In nuclear medicine, we diagnose and treat diseases by using radioactive substances. Normally, these are applied intravenously and accumulate within the organs we want to examine and cure. Nuclear medical diagnostics can supplement radiological examinations (MRI, CT) or even replace them. Examination and therapy procedures with radioactive substances take place working closely together with the nuclear medical department of the university hospital of Bonn and different specialized practices. The treatment with radioactive drugs is carried out at the therapy ward of the university hospital of Bonn, complying with specific radiation protection conditions. Benign and malignant diseases of the thyroid gland and neuroendocrine tumors, e.g., are treated with radioiodine. We would be glad to plan and arrange your nuclear medical diagnostics and therapy. 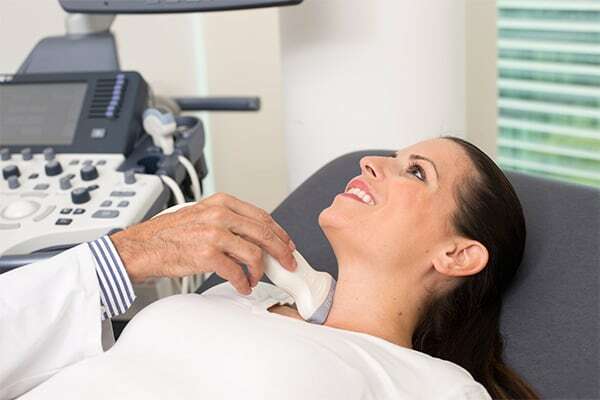 At Beta Klinik, we specialize in the non-invasive diagnostics and therapy of thyroid diseases: special thyroid laboratory and ultrasound examinations. We use drugs or hormones to treat a goiter or hyperthyriodism (overactive thyroid) or hypothyriodism (underproduction of thyroid hormones).